Admit it. You clicked here with a bit of unadulterated curiosity. Which genre of “radical” is this confetti-loving woman? It is, simply, a variety born of my unwavering passion for supporting students on their journeys toward finding and embracing their authentic voices in this big beautiful human existence—a practice I call radical encouragement. And, frankly, I can’t imagine a better thing to be doing on this big beautiful earth. 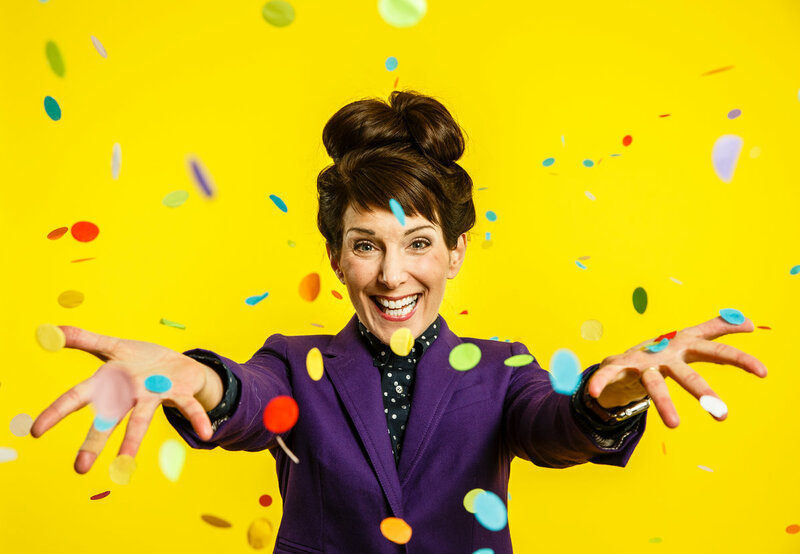 And, absolutely, I’m unequivocally and unmistakably grateful to photographer Mark Brown and writer Jordan Osterman (two cool souls at the University of St. Thomas, MN), for taking time to capture my silly-expressive self in this radically generous piece for St. Thomas Magazine. Collecting adjectives from students to describe Carol Bruess results in a word cloud that could seemingly float away purely on the power of positivity: expressive, enthusiastic, honest, open, special, cheerful, loving, likable, fun, cool, effervescent, kind, gracious, passionate, confident, brave, empowering, transformative. Bruess is guided by decades of research in her focus area of interpersonal communication, and a proverbial compass she said always points her actions toward maintaining healthy relationships and being kind. Countless people take pride in calling her a friend, role model, mentor, colleague. “She’s just one of my favorite people in the world. She makes you feel so special; every time you see her there’s something special about that day,” COJO administrative assistant Oyuna Uranchimeg said. Bruess was always artistic growing up in the small Wisconsin town of Milton, so it was no surprise that she pursued an art degree as an undergraduate at St. Norbert College. Doubting her choice after a bad internship experience, though, she took interpersonal communication as an elective fall of her senior year with Carol Cortez, who quickly became a mentor. <p”>Bruess led the Family Studies float in the 2016 homecoming parade. There was just the simple matter of getting accepted into a graduate interpersonal communication program after graduating with an art degree. Luckily, Bruess had exactly the support she needed: Cortez helped her to complete a great application, and Judy Pearson, then-director of graduate studies at Ohio University’s School of Interpersonal Communication, was willing to take Bruess under her wing when everyone else passed on her application. 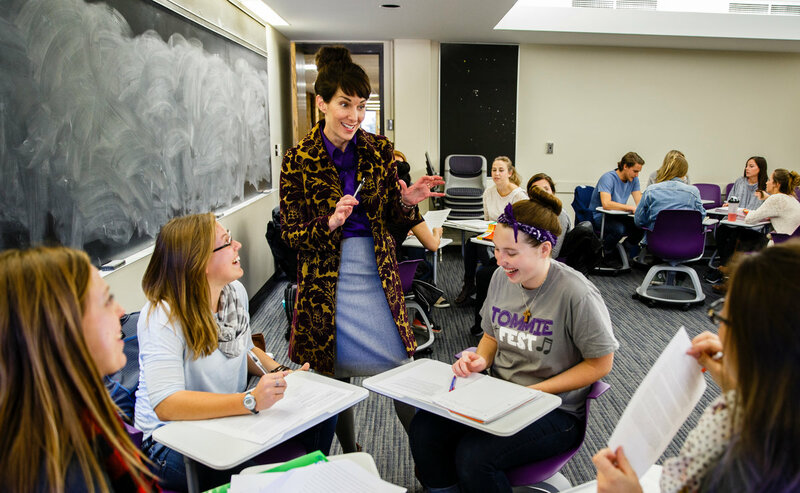 That support has shaped the approach Bruess now takes at St. Thomas, where countless students have benefited from her encouragement. Bruess’ dedication to radical support isn’t lost on the students who prosper from her influence in their lives, inside or outside the classroom. Bruess teaches her Family Studies course. With more than 100 students and advisees each year, Bruess has plenty of opportunities to build relationships that benefit Tommies. As Bruess realized at St. Norbert, one of the best parts of her field is that interpersonal communication is applicable to so many people and in so many ways. In a world with ever-changing modes of communication in relationships, Bruess’ work and teaching hit home. “I knew when I first chose to go into this field that I have an obligation to make sure this makes lives better. Whether it’s my students’ lives, my own family’s lives, lives in the community,” Bruess said. “I think we’re obligated to take what we know and love and what we do best, and make sure it makes lives better outside of our universities. It’s appropriate Bruess uses the medium of television to help share her knowledge: An undeniable aspect of her personality is the visual. Her unique fashion and style most often is exhibited in the clothes she makes herself. Bruess, her husband of 25 years and 16-year-old daughter live just a block from campus, and those who have been to her house (or have read the Minnesota Monthly magazine profile on her fashion and home decor credentials) understand how much art is a part of who she is. The art of her attire also creates a fitting visual backdrop for the daily location where Bruess operates: the intersection of art and science. 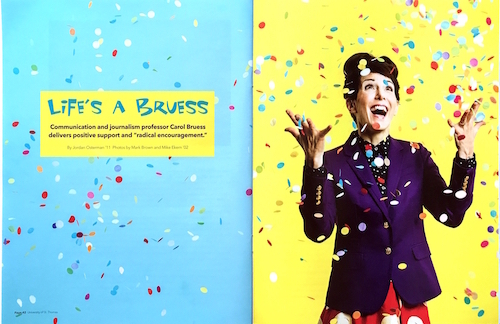 By being informed by decades of research on interpersonal communication and constantly working to live out the benefits of what her field can offer, Bruess is a walking, talking role model of how art plus science equals a dynamic force.